ROAD TOWN, Tortola, VI- Many residents may not understand the huge cost involved to keep them in the know on issues and happenings both locally and regionally. 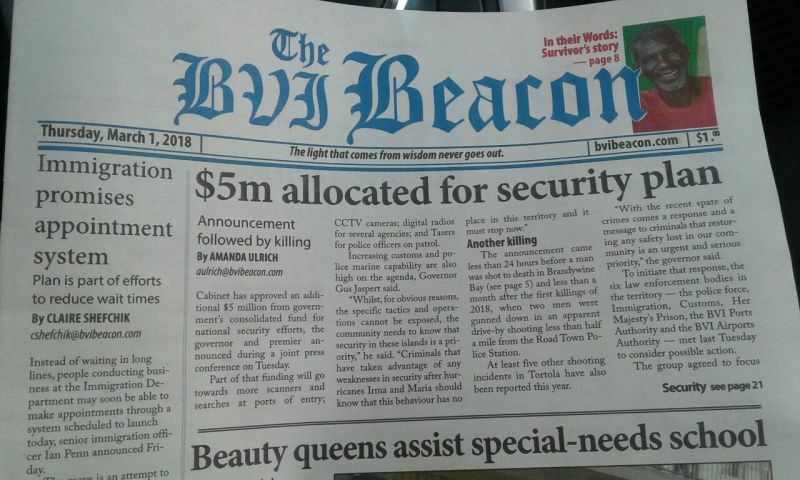 One of the local print media, the BVI Beacon, has now increased its weekly newspaper cost from 50 cents to $1.00, a 100% increase effective from their current March 1, 2018 issue. It is unclear whether the newspaper now being printed in Florida, USA and not in the nearby United States Virgin Islands (USVI) was a factor for the price doubling. 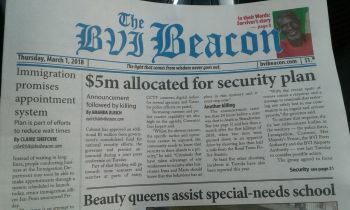 Up to the time of publication, editor of BVI Beacon Mr Freeman Rogers did not respond to our queries on the increase. Following the powerful hurricanes, Irma and Maria, in September 2017 the media businesses also took a hit. 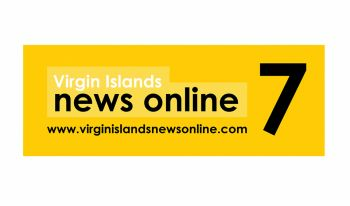 Virgin Islands News Online Head Office located in Cane Garden Bay on the main island on Tortola was severely damaged by Irma on September 6, 2017 and reporters had to flee for their lives, and everything in the office and dwelling area was destroyed. Many other local online news sites lost workers. Some returned to their country of origin after the killer storm, and one radio station cut their staff salary by half in order to remain open. Another online news site is still not operational following the devastation, while others struggle to find employees and housing, as some former employees had returned to their homeland even before the September 2017 hurricanes. It is also not clear if advertisement rates have increased under the new realities of doing business post Irma and Maria. Some three radio and two tv stations remain off the air following the Hurricanes, notwithstanding some have found creative ways via the internet to keep information flowing. Media houses in the Virgin Islands are businesses and they go through challenges like any other small or medium size enterprises. Don’t forget Irma Maria damaged the building so they need to rebuild. not everyone has a computer and it is always good to get other points of view. I like the paper with my cup of tea in the morning-- not staring at the phone. I don't think $1.00 is much to ask. Look at the papers in the US. people still reading news paper!!!! Only those who can read. I bet you don't read news paper! I strongly believe it is the former not the latter. I love my newspapers. I buy all of them. It is only a dollar, for a quality news. It is all worth it! Do they hire b***ks at the beacon? dumb question. who owns it? And do you think a local reporter will tell the truth about a relative if they have to investigate? Kind of like the police. We need good investigative reporters dedicated to uncovering the truth. Start with the lack of audit of the pier park. Bargain. Whack up the cost of publishing liquidation notices too. Cost of liquidation for a company with no assets or liabilities is already a couple of thousand so an increase in the advertisements would not cost much more and would help fund quality journalism. Your name is contrary to your ignorance. As much as we appreciate the instant online news, your disrespect for newspapers show your level of maturity. Just to help you to see the significance, may I challenge you to purchase both local newspapers and go through each page and then come to your own conclusion. Sometimes i wonder . A few blogs up, you were asking if people were still reading news pappers and now you are challenging them to buy them. I am glad Mr Shovels woke you up. It is a clear indication when people are blogging for likes and care little about the topic at hand. I enjoy sitting down and taking my time to read all of the articles. A newspaper has everything in it, no offense to online reporting, they are both good and online reporting gives you the news as it happens. I now have to cherish The Beacon newspapers that I buy and make sure that I read every single word since I for sure now have to get my money worth. Who waits a week for news in this modern age? The future of the Beacon is to go on-line.Imagine placing an ad in this newspaper and have to wait a week for your potential customers to see it. Good luck with that. Either move with the times or the time will move pass you. BVI be positive, it is good to read while relaxing at home, waiting for appointment, even to enhance your memory and reading capabilities. News paper is good as tv and computers are the main reasons why so many people wear glasses today. Please read on every opportunity. Obtain from computers and tv if you can. Wouldn’t that be a 50% increase? It was 50 cents and went up by 50 cents how can that be 50%? The BVIBeacon is already online and has been for years. Though the site is currently under maintenance they provide quality news (no disrespect to the other online sites- I love them all). If you're looking for a job they're classified section is there too. Where did you learn your math, u don't know percentage? What was the original cost of the newspaper? Wasn't it 50cents and now it's a dollar what does that tell you, the price has gone to another 50cents which means it has gone to an additional same as original price. It has increased 100 percent can't be 50 percent LOL. ....ahm, while I agree that online news is the current trend, reading online creates extreme pressure on the eyes rendering them at times the inability to relax while reading from paper allows the eyes the ability to focus on short and longterm positions, therby enhancing the longevity of the eyes. Continue printing the Beacon, Russell. Our eyes will thank you. At least those of us who are counting on reaching old age without the use of glasses!